In conjunction with CAFKA.18 and the Open Ears Festival of Music and Sound, the Kitchener-Waterloo Art Gallery is presenting Post Script featuring work by Rebecca Belmore, Susan Blight, Luke Parnell, Melissa General. Continuing conversations within the exhibition Carry Forward curated for KWAG’s fall 2017 program, Post Script features artworks that access site and land through sound, language and materials. The exhibition builds on the many conversations started by Rebecca Belmore’s influential artwork Ayum-ee-aawach Oomama-mowan: Speaking to Their Mother. During the summer of 1992 Marjorie Beaucage invited artist Rebecca Belmore to bring her performative artwork Ayum-ee-aawach Oomama-mowan: Speaking to Their Mother to the Mother Earth Wiggins Bay Blockade in Northern Saskatchewan. Belmore had travelled across the country inviting different people to speak to the land with the aid of a large megaphone sculpture. Beaucage’s documentary, Speaking to Their Mother, provides a window into Belmore’s process and motivations for making the artwork, while also documenting community members speaking Cree to the clear-cut forest. If we think of land as a document that can be read, imbued with meaning and understood, then every extraction, every trespass, every indelible mark left on its surface impacts how it is to be read in the future. More than 25 years later, this documentary and Belmore’s sculpture highlight how voice and action speak to land. 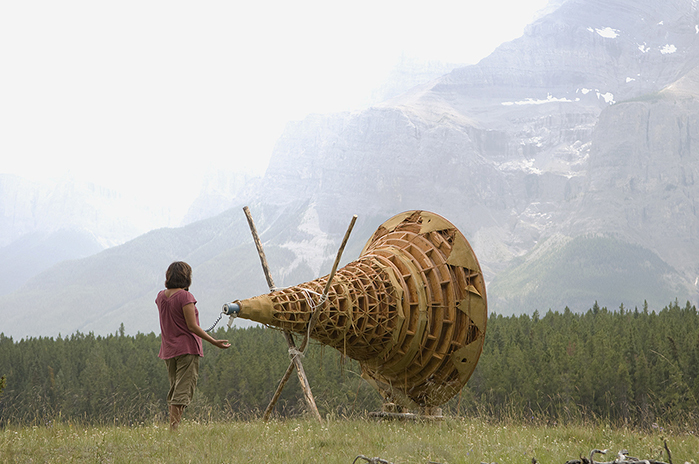 Image above: Rebecca Belmore, Ayum-ee-aawach Oomama-mowan: Speaking to Their Mother (1991), Johnson Lake, Banff National Park, Canada, 2008, courtesy Rebecca Belmore and Walter Phillips Gallery, Banff Centre, Canada, photo: Michael Beynon.